Most affiliates work through a network, which in return for providing a platform through which they can operate, takes a cut of their earnings. You’re already familiar with some of the biggest names in affiliate marketing even if you’re not aware of it (Amazon and eBay, anyone?). Other heavy hitters in the sector include Rakuten Linkshare, CJ by Conversant, Avangate, and ClickBank. ThirstyAffiliates is a solid solution for website monetization via affiliate linking. It’s capable of handling link cloaking, product customization, and categorization; basically, all you need to get started plus some advanced features for power-users. The development team behind the plugin also has several premium add-ons available for it, which you can browse here. If you’re interested in running your own affiliate program (rather than subscribing to one), Affiliates Manager has got you covered. This useful little plugin can handle every step of the process, from recruitment to payouts, saving you thousands of dollars in web development fees for a custom-made platform. Integrated support for WooCommerce, Simple Shopping Cart, WP eCommerce, JigoShop, Easy Digital Downloads, iThemes Exchange, WP eStore, Sell Digital Downloads, Paid Membership Pro and S2Member. This plugin offers a nice solution for managing your affiliate links with a few additional bells and whistles. That being said, it’s mostly aimed towards those users looking for simplicity. The team behind Affiliates may not have strained any muscles while coming up a name for their plugin, but thankfully, they did put a lot of effort into creating a solid affiliate platform. Affiliates will help you set up and manage all the day-to-day aspects of your own affiliate program from within WordPress. Out-of-the-box integration with WooCommerce, Jigoshop, WP e-Commerce, Ecwid, eShop, and Contact Form 7. There’s also premium and enterprise versions of Affiliate available for those with more specific needs. The basic premium version integrates support for Pay per Click, TheCartPress, and Events Manager (for booking-based affiliate programs). 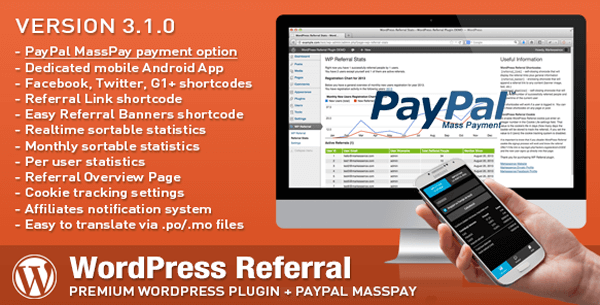 WordPress Affiliate & Referral plugin is a premium solution for managing affiliate programs and all the day-to-day operations this entails. Plus, you can monitor your operation anytime using an integrated Android app. Unlike our other picks for this list, Pretty Link Lite isn’t a solution dedicated solely towards affiliate programs. However, its suite of tools for handling links is strong enough to warrant it a place amongst our other choices. Amazon eStore Affiliates is a premium plugin tailor-made for those who hope to make a living as an Amazon affiliate. To this effect, it includes a plethora of unique features that differentiate it from other plugins, such as its powerful content-spinner tool. The creatively named Amazon Link is a useful tool for (you guessed it) including Amazon product links within your own WordPress posts. All links include your unique Amazon affiliate ID in order to track sales.